Data centers and server racks present a significant fire risk. In many cases fires happen when today’s hot-running and overcrowded server racks and enclosures fall prey to faulty electrical connections, short circuits, power surges, malfunctioning power supplies and electrical arcing. 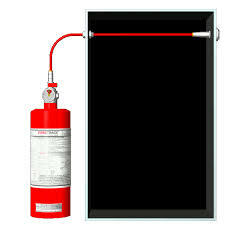 A Firetrace automatic fire suppression system can protect your valuable data equipment and data against loss. Firetrace provides a self-activating standalone fire suppressing solution that detects and suppresses a fire inside of the server rack. Upon detection of fire, the Firetrace system will discharge a “clean” fire-suppressing agent, such as Chemours FM-200 and Novec 1230, which are delivered as a colorless, odorless gas that leaves no residue and requires no cleanup. These clean agents are non-conductive, non-corrosive, and people safe – they are ideal for protecting your mission critical IT equipment and data. Learn More at BASSCOMM SMART SOLUTIONS SEMINAR. Venue: Transcorp Hilton Hotel. 1 Aguiyi Ironsi Street Maitama, Abuja.